Suppose you want to explore interactively the result of a BLAST alignment. 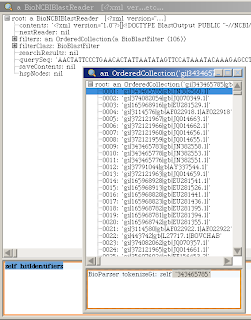 If you have exported the XML format from the NCBI site, you may load it in BioSmalltalk into a BioNCBIBlastReader object, and open an explorer window to send messages to this object. The next step is to find which messages we could send to that object, so you need to browse the object class. This is done by bringing the contextual menu over that object and selecting Browse. Now as you may select any of the browse items, the "browse hierarchy" is the best option when you don't remember all the class behaviors, because will open a Hierarchy Browser enabling to view the whole BioNCBIBlastReader hierarchy. 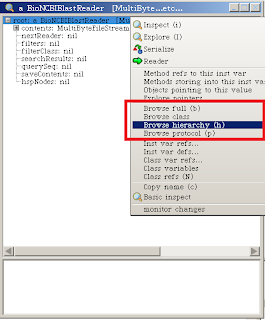 The picture describes the basic architecture of a Class Hierarchy Browser. Generally when exploring an object behavior, the most important is the "Method List" (the 3rd one) which lists all the messages you may send to an object. 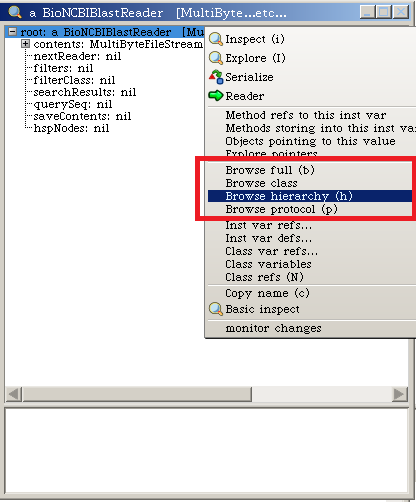 The so-called "Method Pane" or "Code Pane" (the 4th pane) is the region where you may edit the source code, and is where you look at when you try to understand method usage, or modify the implementation. self blastDbName                     " -> 'nr' "
self blastQueryLength                " -> '923'"
self hitAccessionsAsString first: 3  " ->  an OrderedCollection('JN382560.1' 'JQ070349.1' 'EU281529.1')"
self hitAccessionsAsTokens first: 3  " ->  an OrderedCollection(#('JN382560' '1') #('JQ070349' '1') #('EU281529' '1') "
self hspHSeqs first: 2               " -> an OrderedCollection('AACTATTCCCTGAACACTATTAATATAGTTCCATAAATACAAAGAGCCTTATCAGTATTAAATTTATCAAAAATCCCAATAACTCAACACAGAATTTGCACCCTAACCAAATATTACAAACACCACTAGCTAACATAACACGCCCATACACAGACCACAGAATGAATTACCTACGCAAGGGGTAATGTACATAACATTAATGTAATAAAGACATAATATGTATATAGTACATTAAATTATATGCCCCATGCATATAAGCAAGTACATGACCTCTATAGCAGTACATAATACATATAATTATTGACTGTACATAGTACATTATGTCAAATTCATTCTTGATAGTATATCTATTATATATTCCTTACCATTAGATCACGAGCTTAATTACCATGCCGCGTGAAACCAGCAACCCGCTAGGCAAGGATCCCTCTTCTCGCTCCGGGCCCATAAATCGTGGGGGTCGCTATCCAATGAATTTTACCAGGCATCTGGTTCTTTCTTCAGGGCCATCTCATCTAAAACGGTCCATTCTTTCCTCTTAAATAAGACATCTCGATGGACTAATGGCTAATCAGCCCATGCTCACACATAACTGTGCTGTCATACATTTGGTATTTTTTTATTTTGGGGGATGCTTGGACTCAGCTATGGCCGTCAAAGGCCCTGACCCGGAGCATCTATTGTAGCTGGACTTAACTGCATCTTGAGCACCAGCATAATGATAAGCGTGGACATTACAGTCAATGGTCACAGGACATAAATTATATTATATATCCCCCCTTCATAAAAATTTCCCCCTTAAATATCTACCACCACTTTTAACAGACTTTTCCCTAGATACTTATTTAAATTTTTCACGCTTTCAATACTCAATTTAGCACTCCAAACAAAGTCAATATATAAACGCAGGCCCCCCCCCCCCG' 'AACTATTCCCTGAACACTATTAATATAGTTCCATAAATACAAAGAGCCTTATCAGTATTAAATTTATCAAAAATCCCAATAACTCAACACAGAATTTGCACCCTAACCAAATATTACAAACACCACTAGCTAACATAACACGCCCATACACAGACCACAGAATGAATTACCTACGCAAGGGGTAATGTACATAACATTAATGTAATAAAGACATAATATGTATATAGTACATTAAATTATATGCCCCATGCATATAAGCAAGTACATGACCTCTATAGCAGTACATAATACATATAATTATTGACTGTACATAGTACATTATGTCAAATTCATTCTTGATAGTATATCTATTATATATTCCTTACCATTAGATCACGAGCTTAATTACCATGCCGCGTGAAACCAGCAACCCGCTAGGCAGGGATCCCTCTTCTCGCTCCGGGCCCATAAACCGTGGGGGTCGCTATCCAATGAATTTTACCAGGCATCTGGTTCTTTCTTCAGGGCCATCTCATCTAAAACGGTCCATTCTTTCCTCTTAAATAAGACATCTCGATGGACTAATGGCTAATCAGCCCATGCTCACACATAACTGTGCTGTCATACATTTGGTATTTTTTTATTTTGGGGGATGCTTGGACTCAGCTATGGCCGTCAAAGGCCCTGACCCGGAGCATCTATTGTAGCTGGACTTAACTGCATCTTGAGCACCAGCATAATGATAAGCGTGGACATTACAGTCAATGGTCACAGGACATAAATTATATTATATATCCCCCCTTCATAAAAATTTCCCCCTTAAATATCTACCACCACTTTTAACAGACTTTTCCCTAGATACTTATTTAAATTTTTCACGCTTTCAATACTCAATTTAGCACTCCAAACAAAGTCAATATATAAACGCAGGCCCCCCCCCCCCG') "
That's a little introduction of how to work in the Smalltalk environment with Bio objects. Basically remember all the time you have real objects, even the window buttons are objects, and almost all the environment is easily accessible by the very basic tools which exists for more than 30 years!. Following posts will include more tools and more interesting messages for working with BioSmalltalk.